Last week I took the Silver line train into the Seaport section of Boston for the annual Boston Flower and Garden Show. The weekday that I attended a moderate amount of visitors filled the Seaport Center. It was easy to navigate the floor. 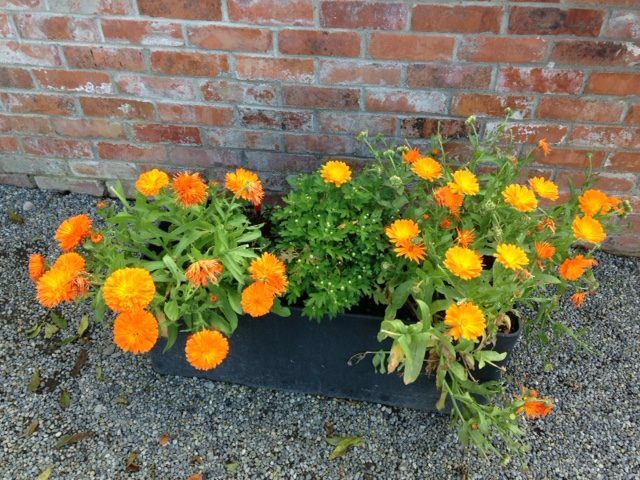 What took me by surprise was the emphasis on container gardening. 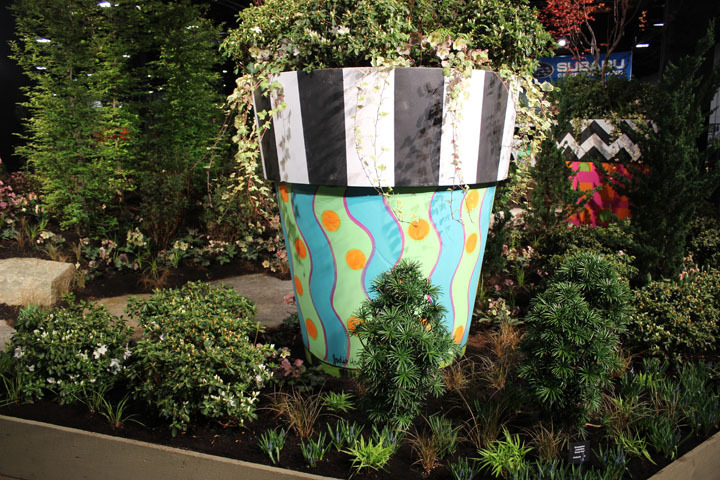 Giant terra-cota pots stood out in this exhibit by Miskovsky Landscaping from Falmouth. 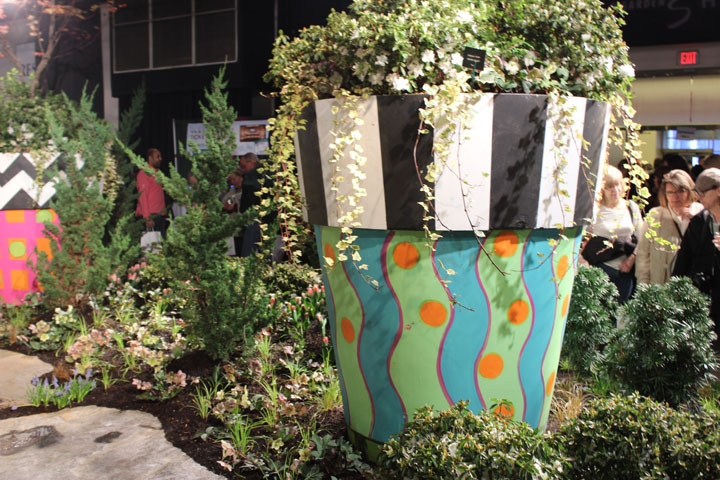 The exhibit included three giant planters, each probably ten feet tall. These pots made of terra-coat were painted in bring, attractive colors. The plantings in each of them were pretty much the same. The center of the pot included a Japanese maple along with shrubs and perennials. Remember these containers were quite large. The exhibit won a prize of $2000 for its outstanding forced plant material, including fruit trees. You could see many bulbs throughout the design. There is no question that the size of the containers made a bold statement about the importance of the container in the landscape. So as I walked around the Show every container after that seemed to be important. The exhibit by Terrascape Design had wrought iron planters with wonderful brightly colored plants. A series of window boxes even caught my eye. Many great plants filled each of them. Right now I am receiving garden catalogs, many with dahlias to sell. In the past I have searched both on-line sources and catalogs to find a particular dahlia tuber that I wanted to plant. It seems to me it is better to choose from the selection offered than spend time looking for a particular variety. There are, after all, over 10,000 registered dahlias. American gardeners have been ordering dahlias since the early 1800s. Nineteenth century Rochester, New York seed company owner James Vick (1818-1882) had over 500 dahlia varieties in his trial fields. He sold named varieties and his own hybrids for that time. The flower has had its ups and downs since the beginning. Now you might say there is a Renaissance of interest in growing dahlias. We like everything about this flower. If the popular dahlia shows in September are any indicator, there are a lot of people today who love dahlias. The price of a dahlia tuber can vary quite a bit. Take ‘Bishop of Llandaff’ as an example. 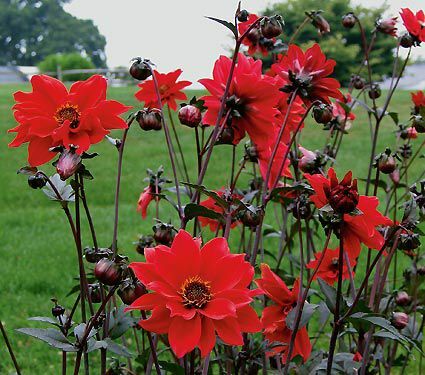 With its dark leaves and bright red flowers, it is one of my favorite dahlias. The least expensive online price for one tuber is $3.25, and the most expensive $11.95. Vick offered ‘White Aster’ in his catalog of 1880 for 25 cents. You can still buy ‘White Aster’ today, but, of course, at the current rate. 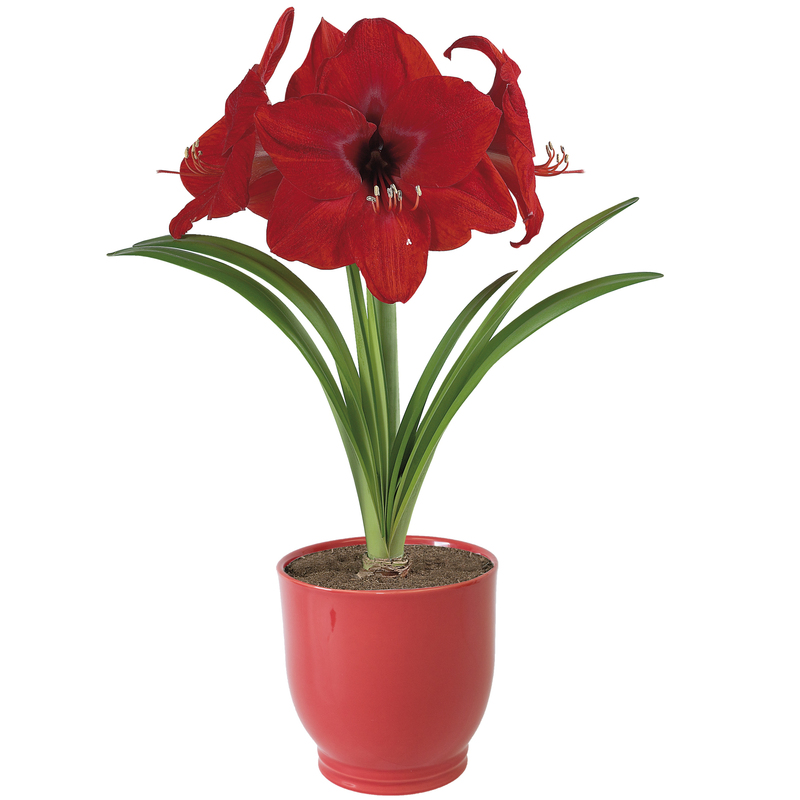 It’s holiday time and for many that means amaryllis as a gift plant. Many gardeners as well as non-gardeners love to grow amaryllis. I counted myself in the former group. That is, until I thought it would be great to have an amaryllis rebloom the following year. 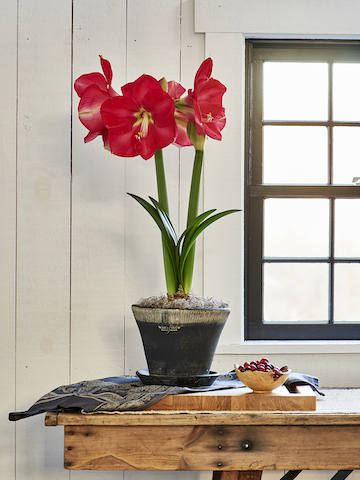 The amaryllis belongs to the tropical plant world. That means for us here in New England an amaryllis becomes a houseplant. A few years ago I received the Smith and Hawken amaryllis called ‘Red Lion’ as a Christmas gift. I had never grown an amaryllis before and I was excited to try it. In early January I potted it according to the instructions and it grew just fine. First the plant’s long green leaves appeared, and then the large red flowers followed. The colorful blooms lasted for a couple of weeks. I was happy with the result. When the plant’s flowers dropped, I simply tossed the contents of the pot in the compost bin. That was my happy first experience with the amaryllis. Four years ago I bought three amaryllis bulbs. I thought the group of three would add a burst of indoor color over those chilly weeks of winter. I chose the variety called ‘Minerva’ which blooms with bright pink and white flowers. After they finished blooming in late March, I wondered if this group of three bulbs would rebloom the following winter. I asked some of my Master Gardener friends what to do. All of them insisted on the need for a dormant period for the bulbs of about three months. I needed to have the bulbs rest in a dark, low heated area of my house, like the basement. 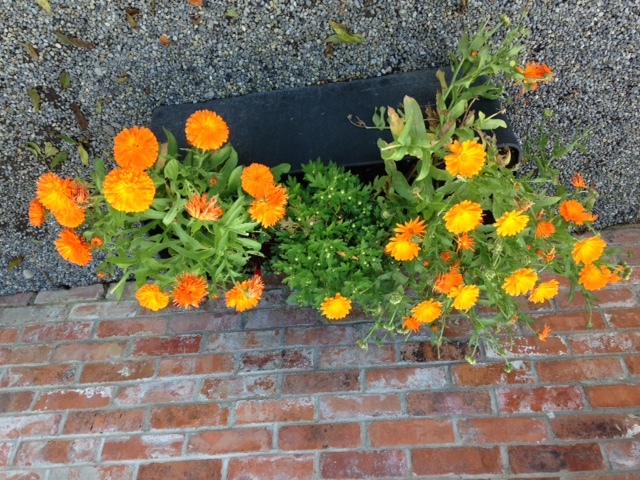 This was of course after I had left them outside in their pots for the entire summer. So I followed their advice. Then I placed the three pots in the bright light of the dining room sun in early January. Over several weeks each grew long green leaves but no flowers of any size ever appeared. I decided to try again the following year. This time I consulted an amaryllis expert I met in the spring at Boston’s Flower and Garden Show. For their dormancy period she advised I store each of the potted bulbs in a separate large brown bag in my cellar for three months. After the three months, it was January and time to bring them out of the basement. I placed each of the pots on a separate stand in front of the dining room window. The leaves grew well. I waited patiently for the flowers to follow, but no flowers ever emerged. This past year I did the same thing. Three brown bags in the cellar followed by light and water in the sunny dining room in January. When I complained to my gardener friends, none of them could give a satisfactory answer. They only raised questions. Did I have them outdoors during the summer in their pots? Was I careful to keep them in a dark place for several weeks? Recently I received a beautiful garden catalog from White Flower Farm. The cover and the first twenty-three pages are dedicated to the amaryllis. Beautiful photos of different amaryllis varieties fill each page. This year I think I might just buy a new amaryllis bulb. I have visited the downtown Georgian Mansion called the Moffatt-Ladd House in Portsmouth, NH many times. What I like about it is that the garden skeleton basically dates back to the Victorian period. Today the gardeners, mostly volunteers, have sought to use garden drawings and written material as a guide for how the garden should look. Luckily in 1990 Joseph Copley, curator of the Portsmouth Historical Society, found the garden journal of the late nineteenth century owner Alexander H. Ladd (1815-1900). 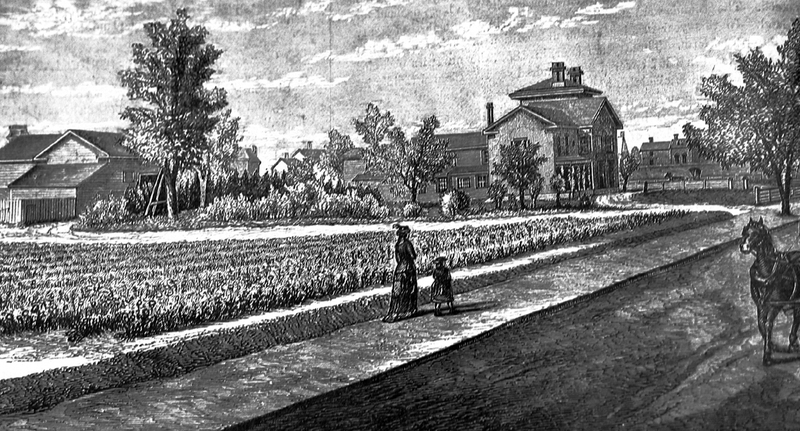 Ladd took possesion of the mansion in 1862. Over the years he lived there he became passionate about his garden, located behind the house. In his journal Ladd writes about several annuals he regularly planted that are still popular today. He mentions these annuals that he grew in his garden: pansy, petunia, sweet pea, verbena, and zinnia. To make room for his spring narcissus, Ladd planted narcissus bulbs in an area where he had earlier planted verbena. The tradition of planting Victorian annuals like verbena continues. Little did Ladd suspect that his favorite annuals would remain popular with gardeners over a century later. It is October 1 and a gardener’s thoughts turn to spring bulbs like tulips. For generations gardeners dug up tulip bulbs only to replant them in the Fall. Rochester, New York seedsman James Vick (1818-1882) recalled that practice in his garden magazine. A suburban gardener wrote to Vick in 1878, “I don’t know of any flowers that afford me more pleasure than my Tulips, because they are so sure and so little trouble. Then she laid out her method of planting the tulips. 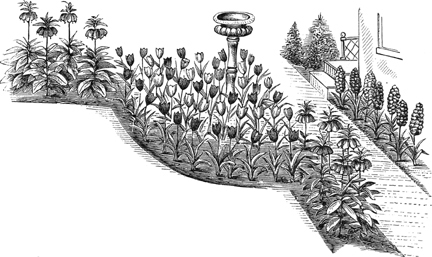 “To occupy the Tulip ground, secure a few Petunia plants, or Portulacas, and sometimes Verbena. “In October these have done flowering, or nearly so, and the Tulip bed is made again. 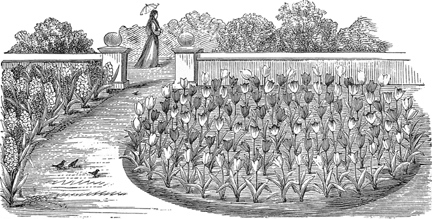 Thus in the late nineteenth century she demonstrated the common practice of planting the same bed with both spring tulips and summer annuals. Like many other late nineteenth century seed companies and nurseries, the Rawson Company, with its main office in Boston’s Fanuel Hall, offered tulips to its customers. In the 1880s Alexander H. Ladd in Portsmouth, NH planted hundreds of tulips each year in his downtown garden. He too would dig them up and store them for the summer only to plant them later in October. Unfortunately, one year his baskets were so heavy on the storage shelves he had created that the whole structure collapsed. Hundreds of bulbs fell to the floor. As you can imagine, the next spring saw a mixture of colors and sizes in Ladd’s fields of tulips. Today it is more common to leave tulips in the ground so they can continue to grow in the same spot year after year. Whether you dig them up after they bloom, or leave them in the ground, October begins the time to plant tulips for spring color. 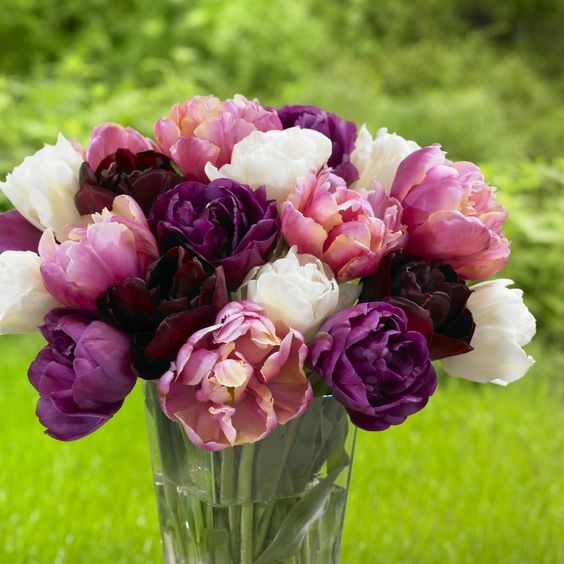 Tulips have been popular flowers for the gardens of Europe and America since the seventeenth century. After tulip mania, when the cost of a single tulip might equal the price of a house, tulips became common and soon gardeners lost interest. In the late Victorian period once again tulips took off as important garden plants. The seed companies and nurseries of the late nineteenth century fed that new interest though articles and illustrations in their catalogs. Of course such garden businesses also provided the latest tulip bulbs. 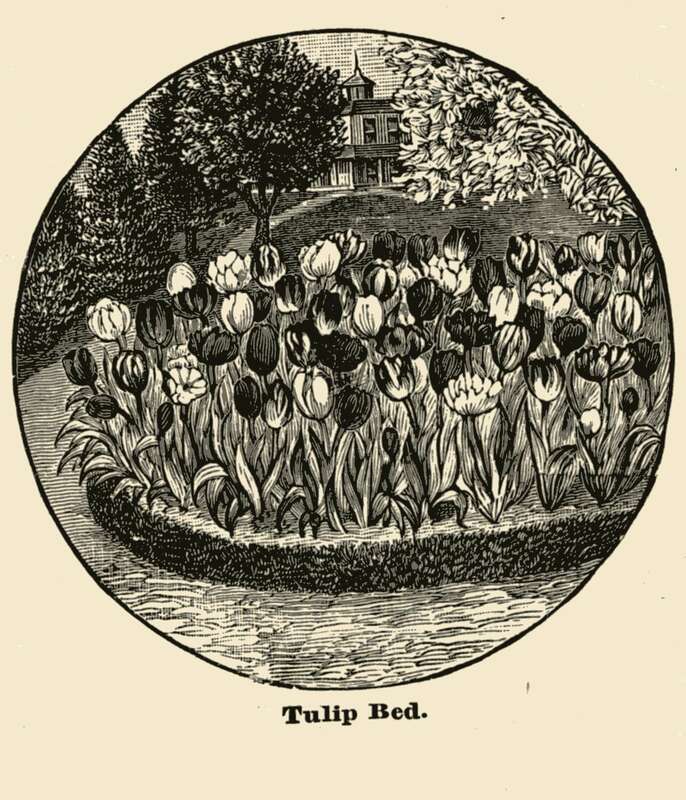 An illustration from another Vick catalog showed a whole bed of tulips. In his magazine Vick’s Illustrated Monthly Vick included this colorful chromolithograph of several popular tulips. Merchant Alexander Hamilton Ladd (1815-1900), a passionate gardener in Portsmouth, New Hampshire, planted sixty thousand tulips every year. 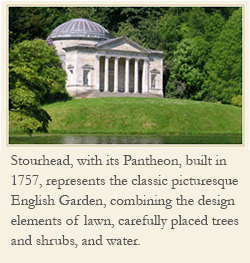 In his garden journal he recorded both the work and the enjoyment from such a massive planting. He certainly embodied the Victorian love of tulips. Tulip mania provides garden marketing lesson. The tulip has long been a popular spring flower. A new tulip farm of several acres opened in Rhode Island a couple of years ago. Now for two or three weeks in April hundreds of people flock to see the fields of thousands of tulips in bloom. You need a reservation just to visit. Though today they are precious to every gardener, tulips once were out of reach of most people when they commanded high prices and were sold to the highest bidder. That happened during the seventeenth century in Holland when the first tulips were arriving from Turkey and Iran. We called the frenzy tulip mania. Tulip mania provides a lesson in the power of garden marketing. The market for the tulip had grown to such an extent that only the rich could afford them. Tulip mania, with its limited market, ended in the winter of 1636-37. Eventually growers in Holland figured out how to grow tulip bulbs in large numbers. The marketing that resulted from the mass production of tulips meant persauding every homeowner to grow them, no matter the size of the garden. No surprise that scenes like the illustration in Rawson’s catalog appeared often. Today most plants you buy at that big box store or garden center are there because they have been mass produced and mass marketed to gardeners like you and me to emphasize their appeal. Thus we probably won’t see another tulip mania. Victorian dahlia ‘White Aster’ still shines. The online garden business called Old House Gardens works with twenty-one growers in fifteen states to provide it’s tubers and bulbs. The Sun Moon Farm in Rindge, New Hampshire supplies some of it’s dahlia tubers. 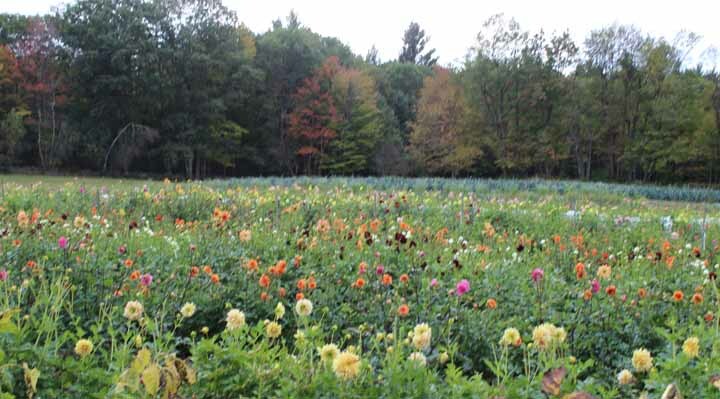 Recently I drove to Rindge to check out Sun Moon Farm, and, of course, see its dahlia field. No fancy sign welcomes you to this CSA working farm. During the growing season the farm supplies vegetables to households in NH as well as Cambridge, Massachusetts. At Sun Moon I found many dahlias in bloom. A dahlia I was in search of was the dahlia ‘White Aster,’ first offered for sale in 1879. Sun Moon’s dahlia ‘White Aster’ filled its own row in the field with its cheery white flower. 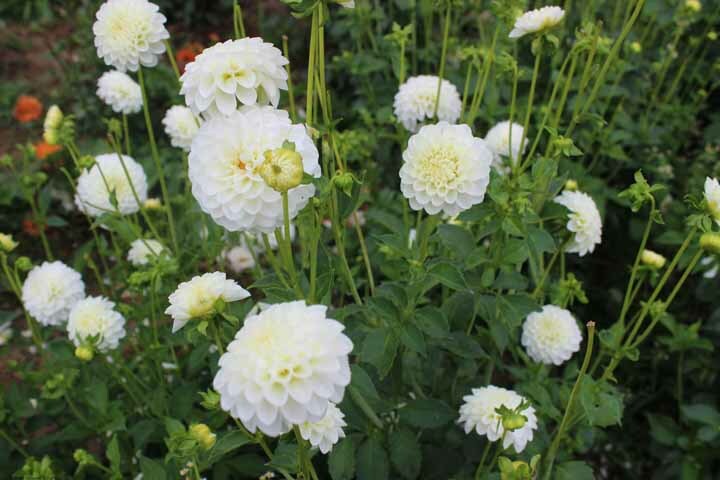 This dahlia shines with its hundreds of small, ivory globes, making it a treasured pompon type which just might add that white color you need in a late summer bouquet. A letter about white dahlias appeared in Rochester, New York seedsman James Vick’s magazine Vick’s Illustrated Monthly in 1879. “Last spring I wanted a white one and mother bought me a root for twenty-five cents. When it had flowers in September, it was the prettiest thing I ever saw. “The flowers were not half as large as my old ones, just as pretty as could be, and didn’t look much like Dahlias, but more like Asters. In response Vick wrote the following: “There are plenty of the small Dahlias, and of all colors that can be desired, except the long sought blue. “There are two very good white sorts White Aster and Little Snowball. Vick recommended ‘White Aster’ but also recognized the importance of dahlias for the fall garden. Sometimes newer gardeners appear to be unfamiliar with the most common of plants. Perhaps it is because there seems to be so much to learn about gardening. That problem is not new. He recognized that gardeners needed to keep up with the newest in garden fashion but also not to forget the older plants. 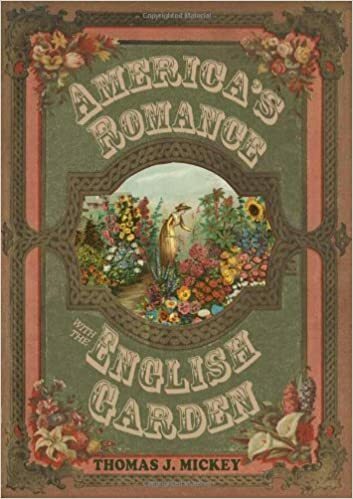 Vick continued, “This is true, and much more true of English gardeners and gardens than of American.” Thus he seemed to put a bit of blame on English gardeners, but praised Americans who were eager to learn about gardening. His conclusion could have been based on his experience with his seed business. He received hundreds of letters every year from his customers, asking questions about plants and gardening. Vick was happy to respond to such questions in both his catalogue and magazine. Today there are dozens of new plants that come on the market every year. Who can keep track of all of them? One solution might be to continue to learn about gardening through garden visits, garden books, and garden social media like blogs. Recently I came upon an old fashioned flower, unknown to me for many years. While in Ireland a couple of weeks ago, I toured the site of the Battle of the Boyne, which took place in 1690 on the River Boyne near the town of Drogheda. A beautiful Victorian garden is now included in the back of the site’s visitor center. There I saw one of my favorite flowers, which I learned about only a year or two ago. Atlanta gardens feature Victorian caladium. The recent Garden Writers Association annual meeting in Atlanta featured several garden tours. Caladium beds appeared in a few of the gardens. 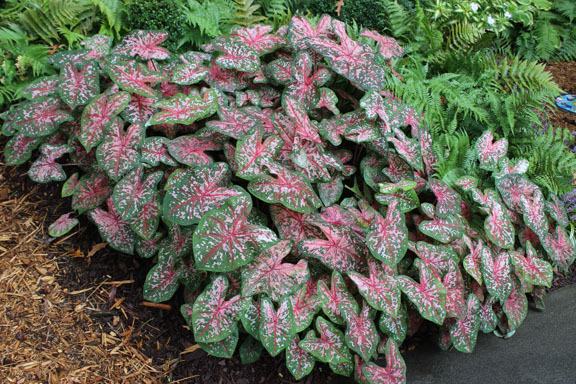 Since I just started growing caladium in my New England garden the last couple of years, I was quite interested in seeing how these shade loving plants grew in Atlanta. Wherever we saw them, I found them to be healthy and vigorous, showing the best of color with their fabulous leaves of green, white, and red. The caladium has appeared in gardens since the Victorian period. Then they naturally ranked among the choicest plants for the garden because of their large, colorful leaves. Rochester seedsman James Vick (1818-1882) sold it in his catalog of 1880. The plant however does not appear in his catalog of the early 1870s. In his magazine Vick’s Illustrated Monthly of 1879 he wrote instructions on winter care for the caladium. A customer from Newfield, New York wrote that the previous year he had lost the caladium that he had stored in the basement. This is certainly timely advice, since we are now in the midst of the month of October, time to think about over-wintering such tender tubers. If protected over the winter, next spring the caladium tuber will be ready to plant in the garden.